The color scale represents the amount of difference from the NEW bracelet to the DAMAGED bracelet. 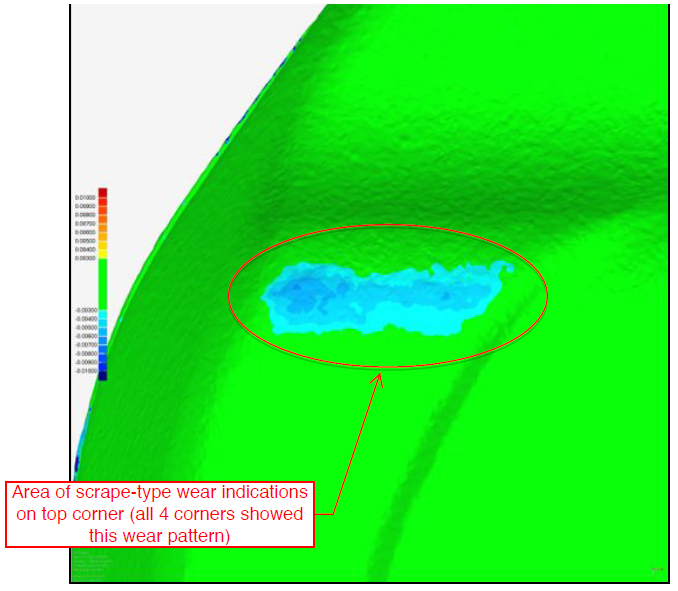 Green means that the NEW and DAMAGED bracelet are within +/- 0.003″ of each other. 0.003″ is the thickness of a standard sheet of paper. 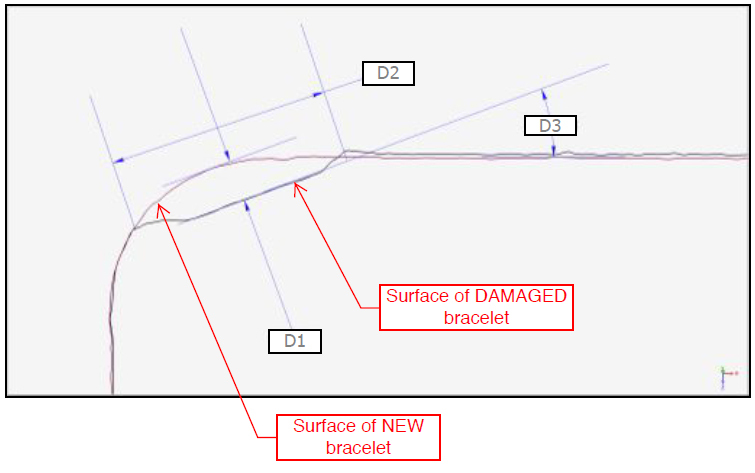 The damaged area is blue in color which means the surface of the DAMAGED bracelet is below the surface of the NEW bracelet. 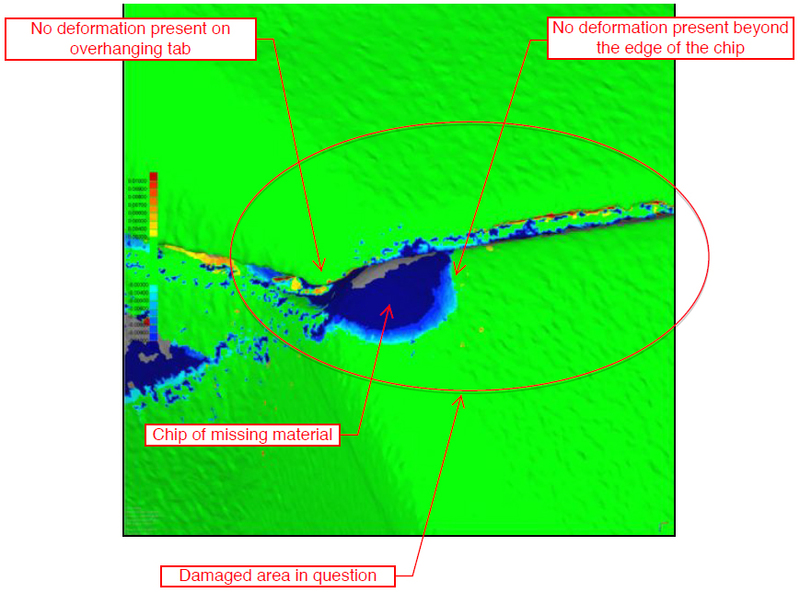 There is no deformation around the damage that would indicate the use of a tool to create the “chip” of missing material. 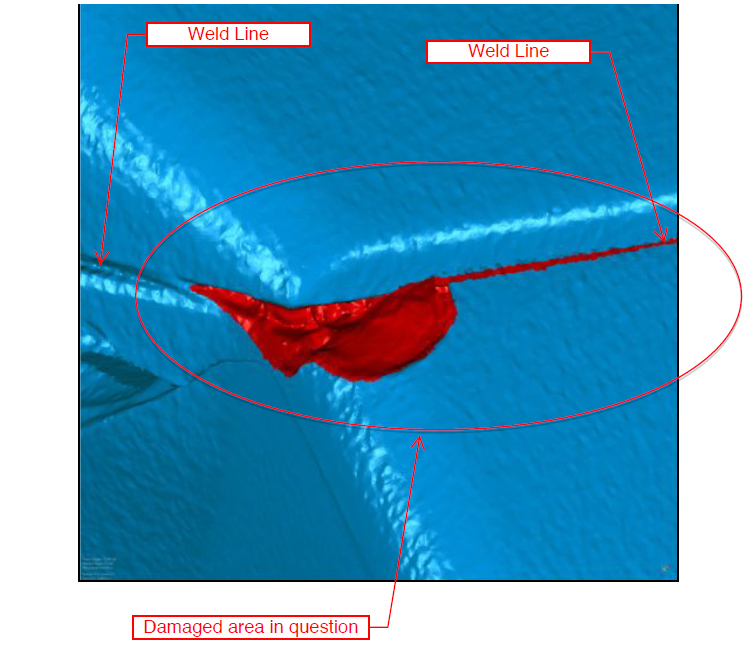 There is also no deformation to the tabbed area of the top piece that overhangs the weld line, further indication that the chip was not forcibly made using a tool. 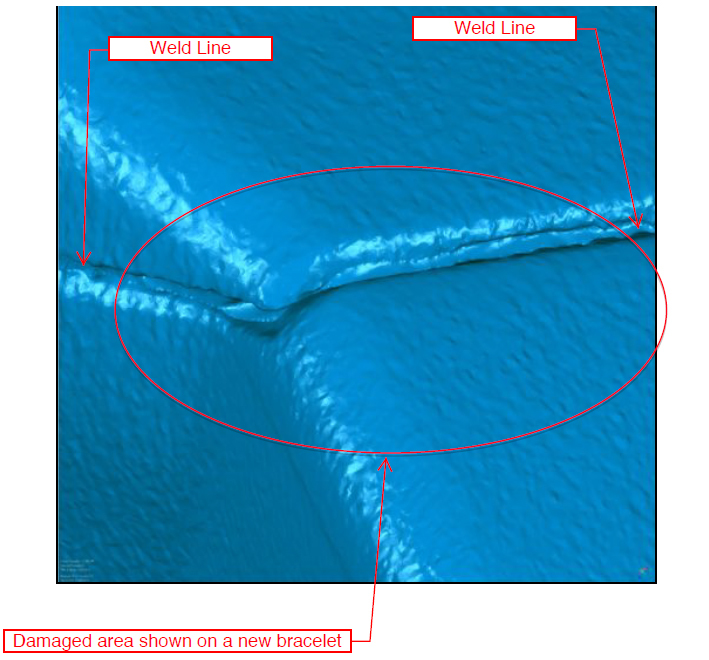 If the bracelet was pulled apart from the damaged corner the force would follow the path of least resistance, in this case the material tore along the bottom side below the weld line. 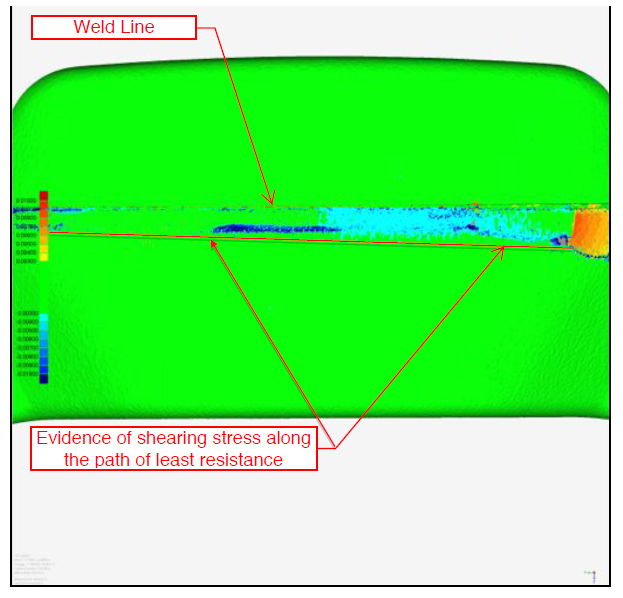 The tearing indications start and end at the weld line corner where the strap extension begins (As Shown in Figure 3). 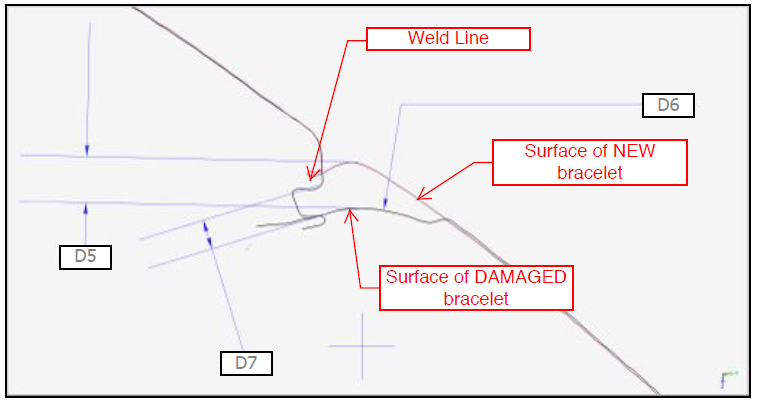 If the bracelet was pulled apart from the damaged corner the force would follow the path of least resistance, in this case the material tore along the top side below the weld line. 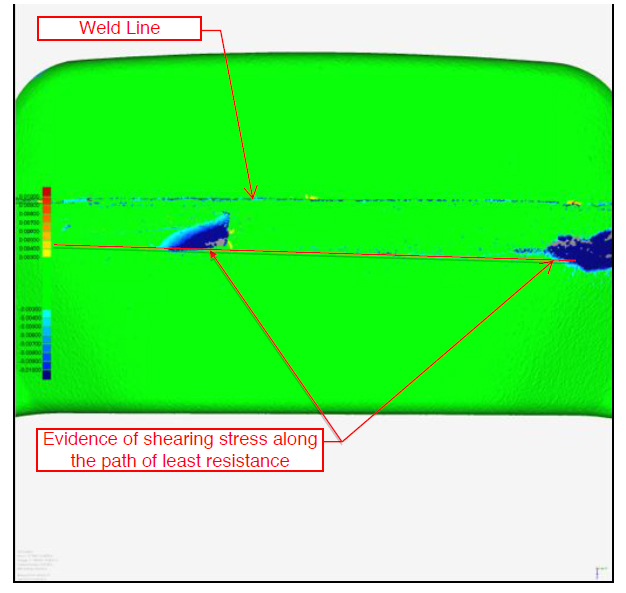 The tearing indications start and end at the weld line corner where the strap extension begins (As Shown in Figure 3). The scrape wear was determined to be from abrasion sustained by the tennis court surface. The depth of this abrasion is 0.004″-0.007″. The thickness of 2 sheets of paper. Even a small area of wear/damage is clearly visible when compared to a new bracelet. The size of the chip is 0.094″ wide and 0.017″ deep, at a 20 degree angle relative to the weld line. The edge is raised slightly and non-uniform. See dimensions D1, D2 & D3 in Figure 7. The size of the chip is 0.081″ wide and has a convex radial floor, 0.018″-0.027″ deep. The edge is non-uniform and non-symmetric. This mark could not have been made with a pointed tool or the floor profile would be concave, not convex. See dimensions D5, D6 & D7 in Figure 8.